I was just in Colorado for a week, looking at gorgeous mountains, alpine forests, and rushing mountain streams—the features that gave John Denver his “Rocky Mountain High.” We also spent a lot of time in vast expanses of what was once pure, unadulterated sagebrush and short-grass prairie. These are habitats that people don’t see as gorgeous except, sometimes, during the brief spring blossom period, but are nevertheless memorialized in two of my all-time favorite songs, “Home on the Range” and “Don’t Fence Me In.” Both of those songs emphasize the wild freedom represented by land, lots of land, under starry skies above, and the wide open country that I love, where buffalo roam and the deer and the antelope play. Of course, both those songs romanticize a cowboy way of life that I’ve certainly never experienced, but something deep in the heart of even a city girl from Chicago responds to that truly American call of the wild. But even as we romanticized the open spaces of the American West, we were destroying their wild essence, decimating the human beings who had genuinely integrated their lives with the plants and animals of the wild, and wiping out the animals, too. Bison are by nature nomadic, never overgrazing an area before moving on, but now even in the restricted areas where we can see them in what looks like the wild, they are always fenced in to keep them off our highways and the vast rangelands overgrazed by a never-ending infusion of domesticated cattle as pumpjacks rhythmically pump away, extracting the oil and gas with which we fuel this new American lifestyle, our car and SUV commercials glamorizing the high-speed off-road automotive freedom that destroys even more of the essentially wild character of these vast open spaces that once represented the true heartland of our continent. 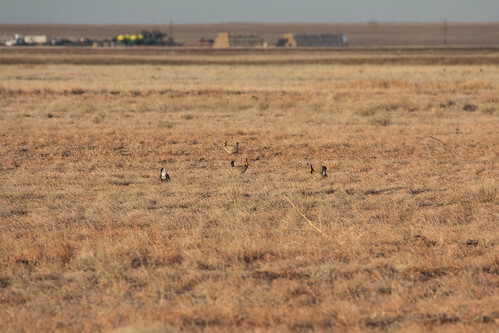 I went to Colorado in particular to see some of the characteristic birds of wide-open spaces. 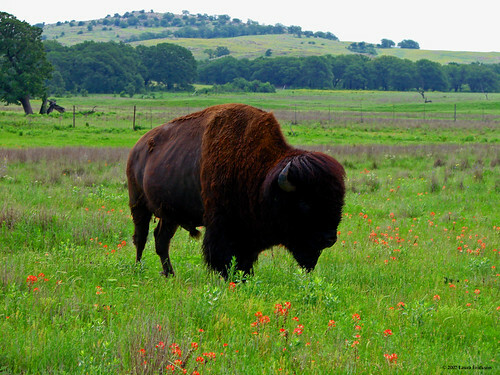 Buffalo once grazed companionably with prairie grouse and Mountain Plovers. 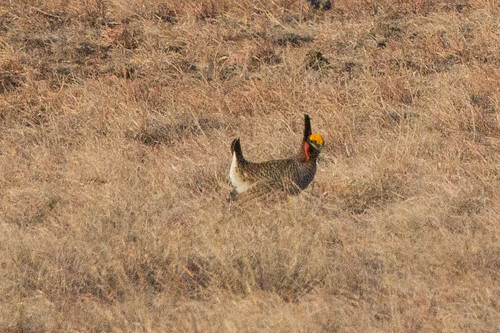 The short-grass prairies were characterized by prairie chickens, sagebrush land by sage grouse. We visited the Pawnee National Grasslands—a patch of what was once fabulously rich habitat that was literally blown away by the extensive over-cultivation that led to the Dust Bowl. The US government set it aside after that disaster, trying to save a little patch of habitat bordered and crisscrossed by highways in the center of what was once an endless expanse of wilderness. Even within the heart of these grasslands, towns and farms remain, and overgrazing compounded by the devastating drought of the past few years are leading to the same conditions that caused the devastating Dust Bowl. 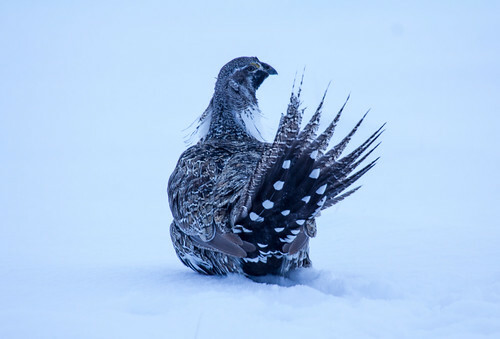 Prairie grouse that inspired many Native American dances and rituals have been decimated, Gunnison Sage-Grouse and Lesser Prairie-Chickens critically endangered and Greater Sage-Grouse and Greater Prairie-Chicken in dire trouble. These birds don’t just yearn for those wide open spaces and the lack of fences—they genuinely need them. We sing about the elements that characterized what was truly and uniquely America—these most fundamentally American of birds require them. In coming days, I’ll talk about my experiences in Colorado and what some treasured American birds are facing in a world where squandering natural resources of all kinds has become the order of the day. This entry was posted in Uncategorized on April 24, 2013 by Laura Erickson. In March 1999, Russ and I and our kids spent spring vacation in Florida. The kids wanted to go to some Orlando theme parks. Russ wanted to visit the Kennedy Space Center. And me—I wanted to bring my lifelist to 600. 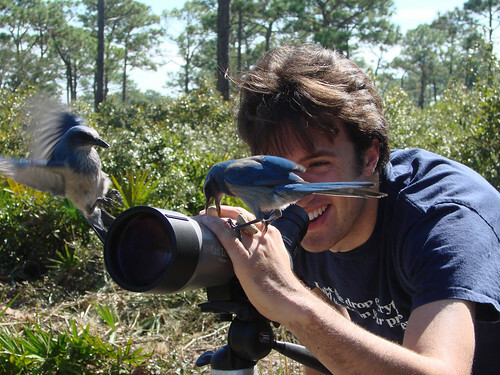 The bird that brought me to that milestone marker is perhaps the friendliest bird on the planet—the Florida Scrub-Jay. When we arrived at Lake Kissimmee State Park, we asked the gate attendant where we should go. She said just part the car and look around right there, and sure enough, in came a whole family of scrub-jays to check us out! 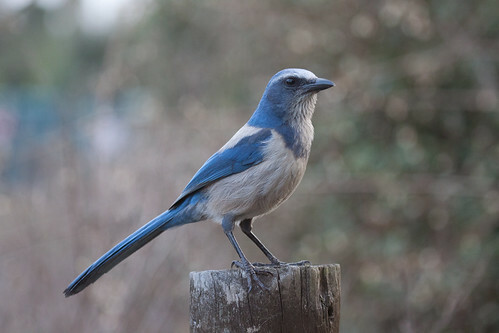 At some point, one of the kids put our family mascot, a charming little puppet named Piggy, on a tree branch and the scrub-jays flew right over to check him out. I dragged my family along on lots of birding adventures over the years, but coming again and again to Lake Kissimmee State Park to see these charismatic birds has been one of the few that everyone enjoys without reservations. It’s hard to believe that a bird so beautiful, so friendly, and so very easy to see if you’re at the right place can be in such dire trouble. It was listed as Threatened in 1987, but has declined so dramatically that it definitely deserves being upgraded to get all the protections involved in being listed as legally endangered. Just between 1982 and 1992, the population dropped a full 50 percent, to a level estimated to be a mere 10 percent of pre-settlement levels. Between that 1992 survey and 2007, the population dropped another 50 percent! Maps of the species diminishing range are depressing not just because the overall area is shrinking but also because it’s getting so fragmented. 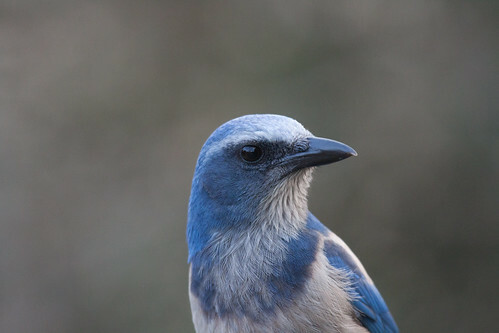 Florida Scrub-Jays are exceptional homebodies by bird standards, few wandering at any time in their lives far from the territory where they hatched. Scientists are now detecting changes in vocalizations from one area to another, indicating that the remaining islands of populations are getting genetically and behaviorally isolated, making the situation even more dire. 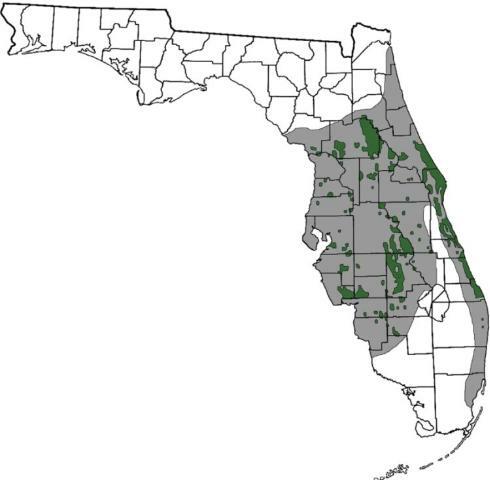 Florida Scrub-Jays require oaks, especially scrub-oaks, and do poorly when natural fires are suppressed long enough for vegetation to get too overgrown. 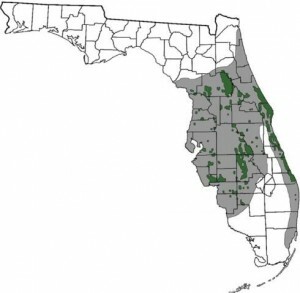 Right now, most management for them is occurring in areas where the largest strongholds still exist, such as at Lake Kissimmee State Park, Merritt Island National Wildlife Refuge, and Archbold Biological Station. This makes a kind of sense, but if the species is going to be saved, it absolutely needs quality habitat bridging those strongholds. 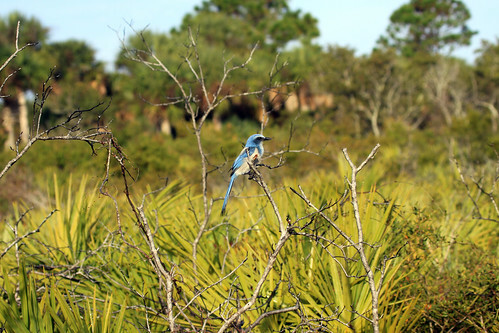 The Florida Scrub-Jay Trail is a non-profit group trying desperately to enlist private landholders to set aside good habitat for these splendid birds. Cathy and Bruce Brown know that only by bridging the fairly large strongholds with smaller “trails” of habitat can we prevent further losses of this treasured bird. 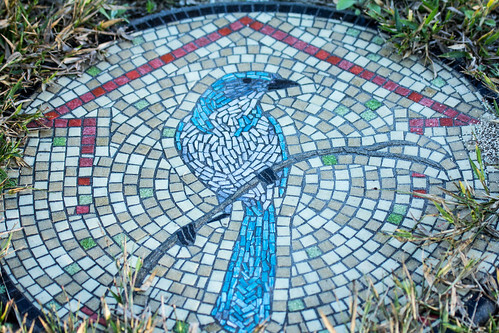 They provide all kinds of workshops and fun events to make people more aware of scrub-jays and their plight. 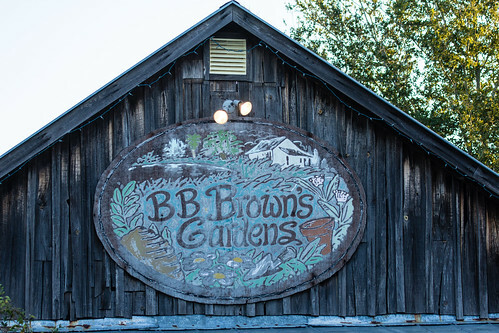 Via their gardening store they provide plants and gardening tips to help people get started managing part of their land for the jays, while providing field trips to show their own lovely family of scrub-jays to the public to motivate them. My very best photos of Florida Scrub-Jays have been taken at their place. They get some funding from the National Wildlife Federation, but for the most part have been doing this all-consuming work simply because it needs to be done. During the course of my Conservation Big Year, I’ll be tallying up every mile I travel for birding, and contribute at least a penny per mile to conservation organizations. 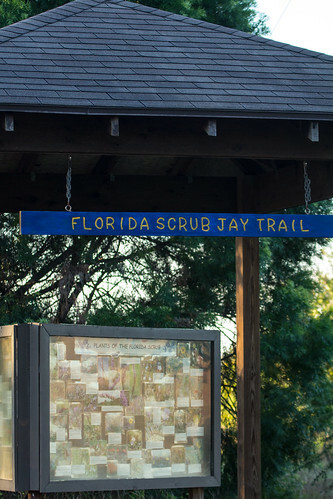 The very first one I’m targeting for a contribution is the Florida Scrub-Jay Trail. Why? Valuable and well-funded study and management is being done at some critical strongholds already, but unless we can bridge them, genetic isolation may doom the species, and a single outbreak of West Nile virus or an out-of-control fire could wipe out one or more of the remaining populations. Bruce and Cathy work with the US Fish and Wildlife Service and the US Geological Survey, but do all their own fundraising. Their critical grassroots work truly deserves our grassroots support. You can learn more about Bruce and Cathy’s vital work at www.scrubjaytrail.org.